Now Who Will Keep the Boston Brahmin Accent Alive? August 25, 2009 was a day that marked the end of an era. As I reflected on my years in Massachusetts and the time I spent working on Ted Kennedy’s presidential campaign, I couldn't quite grasp what had happened. I had already been stunned by Michael Jackson's and Farah Fawcett's recent passing, but now Ted? Someone I had a personal connection with? As the third longest-serving member of the United States Senate, Ted Kennedy showed a commitment to both the citizens of Massachusetts and the United States that was unmatched. As President Obama said, “For five decades, virtually every major piece of legislation to advance the civil rights, health, and economic well-being of the American people bore Ted Kennedy's name and resulted from his efforts.” I was naturally happy to hear that LIFE Magazine had prepared a commemorative book that chronicled his life, The Kennedys: End of a Dynasty. The book beautifully celebrates the Kennedys' journey from Irish immigrants stricken by poverty to national icons reaching the highest ranks of American society. The editors reveal both the glamour and drama associated with the family’s position on the public stage. Intimate family photographs make the story even more lucid and riveting. Jackie, Bobby, Jack, Teddy.... they're all here in black & white and color splendor. Robert Sullivan, LIFE Books’ editorial director, is an authority on the Kennedy family and it shows. 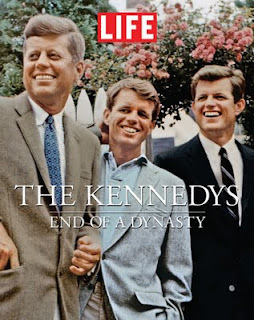 The Kennedys: End of a Dynasty is available at bookstores, newsstands and online.